Recombinant Human beta-Defensin 1 produced in E. coli isa single non-glycosylated polypeptide chain containing 47 amino acids and having a molecular mass of approximately 5.0 KDa,. Fully biologically active when compared to standard. Determined by its ability to chemoattract CD34+ dendritic cells using a concentration range of 0.1-1.0 ug/ml. Less than 1EU/mg of rHuBD-1 as determined by LAL method. This lyophilized preparation is stable for several weeks at 2-8°C, but should be kept at -20°C for long term storage, preferably desiccated. Upon reconstitution, the preparation is stable for up to one week at 2-8°C. For maximal stability, apportion the reconstituted preparation into working aliquots and store at -20°C to -70°C. Avoid repeated freeze/thaw cycles. 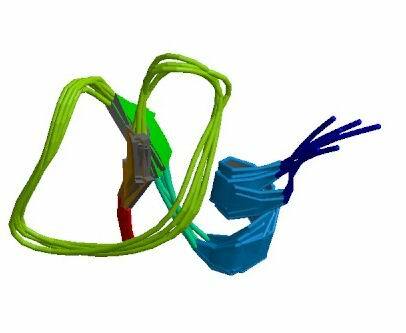 PDB rendering based on 1e4s.